Thinking about buying one of those Chinese-made lightweight aluminum racing jacks that many retailers and online sellers are peddling these days? You might want to think twice before spending $70 to $200 for one of these jacks. The light weight, ability to fit under vehicles with low ground clearance, and a low price are all very attractive features. But these jacks are not what they seem. Many people who have bought one of these aluminum racing jacks (myself included) have discovered the jacks are poorly made and do not hold up. I bought my 1-1/2 ton aluminum racing jack (part number 34745) for $140 a little over a year ago from an auto parts retailer that has since been acquired by a larger chain. The jack had a brand label on it from a well-know aftermarket supplier, so I assumed the company would not put their name on a product that did not meet their quality standards. The jack seemed like the perfect solution for home use. Its low clearance would fit under my son's MINI Cooper (which my old Sears two-ton steel floor jack would not), and the light weight would make the jack easily portable. The jack came with a one year warranty. One year and one week after I bought it, my aluminum racing jack called it quits. Instead of lifting, the jack just made squishing sounds when I pumped the handle up and down, as if it had reached its maximum rated load. The owners manual said to check the fluid level or to bleed the system. The fluid level was full and there were no external leaks. I tried bleeding the jack several times but nothing changed. It just wouldn't lift because it was leaking pressure internally. I thought maybe a piece of dirt had somehow gotten into the bypass valve, causing it to leak pressure internally. I removed the screw that said "DO NOT ADJUST", and disassembled, cleaned and inspected the bypass check ball and spring. No problem there. The fault was inside the power ram, probably a bad piston or ram seal. I called the toll free number in the manual about the warranty, and was told that because I had purchased my aluminum racing jack over a year ago, it was no longer covered under warranty. The Asian customer service lady on the phone said "So Sorry." I was then told I could order a new ram unit for $40 plus shipping ($11), and repair the jack myself. The customer service lady could not tell me where the part would be come from or how long it might take to arrive. I also contacted the aftermarket company whose name was on the jack, hoping they could resolve my problem (I also wanted to give them an ear full about the cheap crappy jack they were selling). But I never received a reply to the comments I submitted on their website. No email acknowledgment. No call back. No apology. Nothing. So sorry. I'm sorry too. I'm sorry I bought the jack, and I'm sorry my lightweight aluminum racing jack is a piece of junk that is no longer functional or safe to use. I don't care what brand is on a product, or who makes it, there is NO EXCUSE for a floor jack to crap out after only a year of very light home use.That's totally unacceptable in my book. 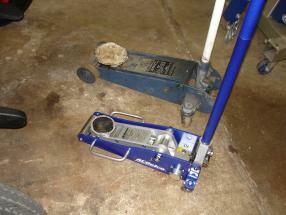 A floor jack should provide years of trouble-free service, regardless of its price. It should not be a disposable item. I also have an old Sears Craftsman floor jack that is over 30 years old. It was Made in the USA out of solid steel and is heavy as hell. But it has never leaked, slipped or failed to lift virtually anything I've shoved it under. 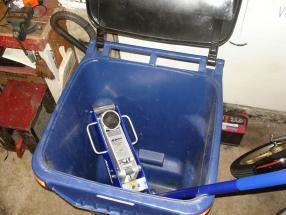 It's a rugged, dependable, reliable floor jack. Too bad they don't make that model any more. My old ugy, heavy steel floor jack (top) still works great after 30 years. My shiny relatively new lightweight aluminum racing jack (bottom) called it quits after a year. If you search product reviews online, you will find a wide range of ratings and opinions about these cheap Chinese-made aluminum racing jacks. In all fairness, some users say they are very happy with their jacks, and have had no problems (yet). But for every satisfied customer, there are just as many if not more dissatisfied customers who have complained about their aluminum racing jacks. Some users have at had problems right out of the box with leaks, missing parts, or the jack would not lift. There are also LOTS of comments from users who have had an experience similar to mine, where the jack worked fine for awhile, but quit working after a relatively short period of use. Some buyers admitted they did not expect such a cheap jack to last very long (so why did they buy it in the first place?). Others say the cheap aluminum racing jacks are junk, and I certainly agree. They say you get what you pay for, and I say you don't even get that sometimes. This aluminum racing jack ended up as junk in the trash can. Made in China: Let the Buyer Beware! The Chinese-made lightweight aluminum racing jacks all look pretty much the same, and I suspect they are all produced in the same sweat shop factory. The jacks are imported and sold by numerous distributors through auto parts stores, retail stores and online. Harbor Freight sells them, so does Sears, Summit Racing, Jegs, Advanced Auto, AutoZone, PepBoys and many other retailers. Some of these jacks have a brand name on the box while others are private label or no label. 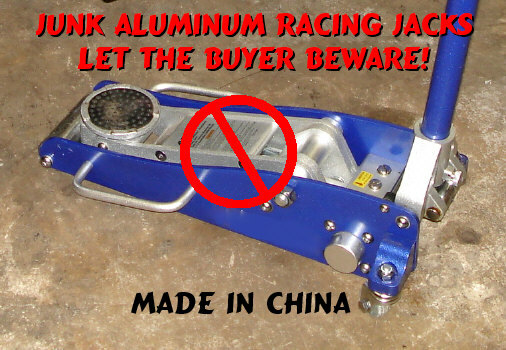 The problem with these Chinese-made aluminum racing jacks (as well as many Chinese-made tools, automotive parts and consumer goods) is that they are CHEAP. I mean really cheap. Cheaply made with low cost unskilled labor and the cheapest materials. There is little or no quality control or consistency in the manufacturing process. There is no materials analysis, no durability testing, not even somebody standing at the end of the assembly line to make sure each and every jack passes some kind of lift test. And no safety certification. The Chinese philosophy of manufacturing is simple: copy a product, make it look good, but cut every corner in the manufacturing process so it can be sold cheap to make a fast Yankee buck. Is it any wonder that the quality of the Chinese-made products is so inconsistent and often shoddy? Yet uninformed consumers continue to buy their crap because they don't know any better. To make matters worse, American companies who used to sell reputable products with brand names you could trust have apparently sold out their reputations to the almighty dollar. Nobody manufacturers anything here anymore. They just buy their products from offshore suppliers and stick their name on the box. It's a good business model for making lots of money, but at what price? If an aluminum racing jack or any other Chinese-made product fails, so what? At such low prices, the sucker who bought it will just have to buy another one. If China wants to supply all of the world's manufactured goods, they better start paying more attention to their manufacturing processes and lack of quality and consistency. The manufacturers (and their distributors) should be held accountable for the junk they're selling. Floor Jacks: Any Good Ones Out There?